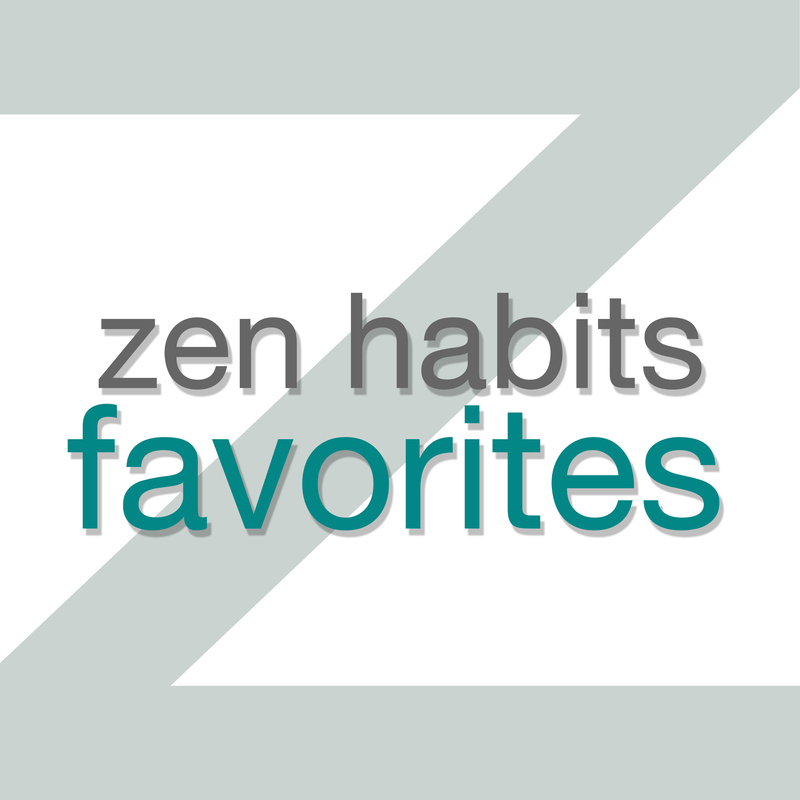 Zen Habits Audio – Page 21 – Home of the Zen Habits Favorites podcast. Sometimes I lounge lazily in bed, in the middle of the day, with a couple of my kids and just abandon my worldly concerns, and just play. How to Be Childlike was originally posted on Zen Habits on 9/16/09. I love reading about other people’s work setups, I really do. It’s one of my guilty pleasures. I’ll read about another blogger’s computer setup, or what kind of notebook and pen he uses, or how he works standing up or on a treadmill or while doing handstand pushups and growing a vegetable garden. And when I read about some cool setup someone else has, some cool new way of working, I inevitably want to try it. I’m only human. You’ve done this too, probably. You might read a review of some new software that will help you create, or a new fashion style or some cool shoes or beautiful furniture or the newest iPad, or the latest iPhone app. Or maybe you’re a minimalist and read someone’s barefoot running article, or how they’re living out of a backpack, and want to try that. We’re endlessly looking at how others do things, for inspiration and ideas … but we end up wanting to try those things too. That sounds harmless until you realize that you’ll buy almost anything because someone wrote about it and made it sound amazing. You’ll live a life of an endless series of purchases because of what other people are doing. And it never ends. Even if you don’t buy stuff, you’ll change your life endlessly, based on what others are doing. You’ll give up your couch, you’ll stop buying Ikea furniture, then give up your cell phone, then give up your computer, then start doing yoga, then become a Zen monk, then create a tech startup. Those things are amazing, sure … but when does it ever end? When do we ever feel content with the life we’re living? of the moment, of inner peace. The Comparison Trap was originally posted on Zen Habits on 6/1/11. Then I would respond and thank the commenter for his criticism. I’d acknowledge their point without being defensive. I’d respond with my reasoning, if I felt I had a point, or if the critic was right I would agree and let them know I was going to change things. Either way, I was grateful for their criticism. This had a startling effect: the commenter would often respond very positively. Thanking the commenter and acknowledging their point is disarming. People who leave rude comments don’t expect you to listen to them, much less be grateful and empathetic. I had many of my critics become friends after doing that — I’ve never seen a tactic have better results. Criticism can bring you down if you let it. People get discouraged when faced with criticism, and just give up. That can be understandable, but why let the words of someone having a bad day (or month) stop you from doing something great? What would have happened if Shakespeare had stopped writing the first time an audience member jeered one of his lines? Or if Gandhi had given up just because the Brits weren’t happy with his ways? Ask yourself why the criticism was made. Is the person trying to help, to make things better, to help you avoid making mistakes, to suggest positive improvements? Is the person just in a cranky rude mood, having a bad day? Is the person just mean, or jealous? Is there good reason for the criticism? The Art of Handling Criticism Gracefully was originally posted on Zen Habits on 3/31/11.